This morning on the Cetacea for the 9am whale watch, we traveled to the mid bank of Stellwagen Bank in search of whales. We were quickly rewarded with a sighting of Freckles who was taking about 5 minute fluking dives. We spent about 15 minute with Freckles before deciding to move on in search of a humpback we saw in the distance. This humpback turned out to be Rapier who delighted us with an impressive show of kick feeding as she travelled between different bait balls. We were also lucky enough to see a fin whale and 5 minkes along the way. Overall, it was a great morning full of activity on the bank. On the 1:30 whale watch aboard the Cetacea, we headed to the same location where we had spent the morning. We located 2 humpbacks in the distance, but decided to head towards the whale we thought was Rapier who we saw was continuing to kick feed. It was Rapier who continued her show. In addition, we saw 3 other humpbacks in the same area also feeding, one that we were able to identify as Flounder. There were quite a lot of minke whales in the area and great bird sightings of Wilson’s storm-petrel and great shearwaters. On board the Asteria for the 10am whale watch we traveled to the southwest corner and then north to mid-bank. Once we got to the bank, we had near perfect conditions with very smooth glassy seas. First we found Dyad, a humpback whale. It was doing it’s odd surface, immediate fluke up dive, and resurface behavior. Next we spent some time with Hancock, who was also in the area. She was doing 4-6 minute dives and even surfaced in a huge bubble cloud right next to the boat. 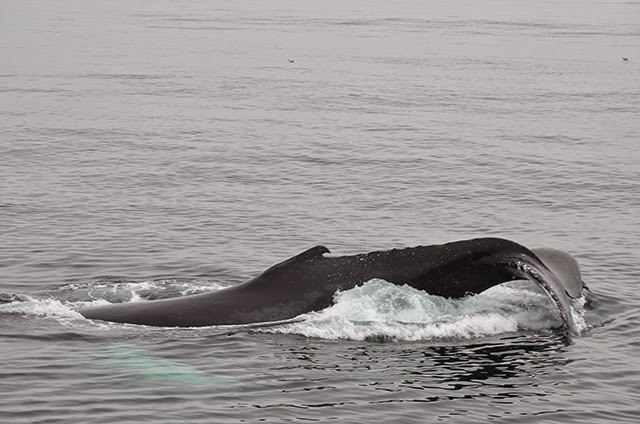 We then traveled a little further north towards mid-bank and found 3 scattered humpbacks, 4 minkes, and 1 finback whale. 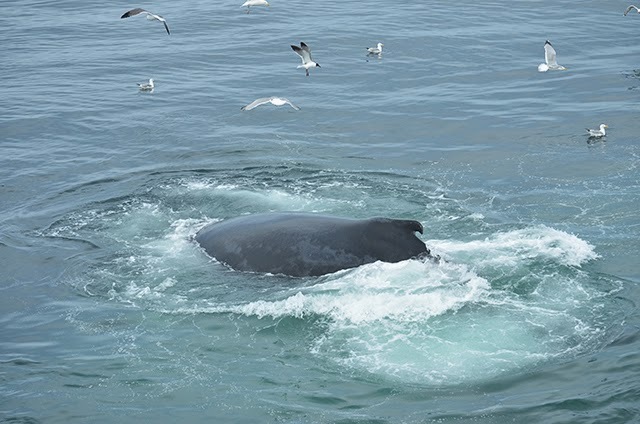 We identified one of the humpbacks to be Rapier and the other two were unidentified. She was doing short 3-5 minute dives and feeding. 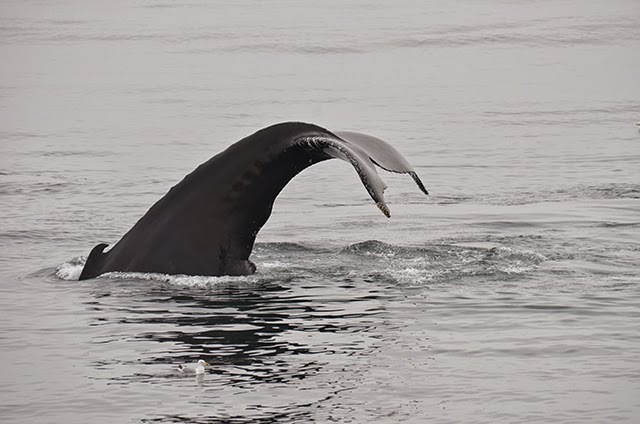 Passengers loved when Rapier repeatedly kick fed at the surface, stunning her prey with each splash of her tail. For the 3pm trip, we traveled back to mid-bank. We found 5 scattered humpbacks and at least 3 minke whales. First we spent some time with Rapier. She was doing more kick feeding like on our earlier trip. Also in the area we spotted a Type 5 humpback whale. It was Underline! Underline was taking short 2-3 minute dives, and fluking consistently which made it easy to ID. We then traveled a short distance to a pair of humpbacks. It was Flounder and Doric. Flounder fluked nicely for us, so we could easily ID it, but Doric made it tough. Just like when I sighted Doric last season, it was hard to get a fluke shot of it. But in the end we did ID it by looking at its dorsal fin. Doric has a past tagging scar on the right side of its dorsal. Overall, it was a great day out on the bank. Today on the Aurora we headed to the southeast corner. The visibility was poor in the harbor but cleared out nicely right past Minot's Light and the seas were glass calm. 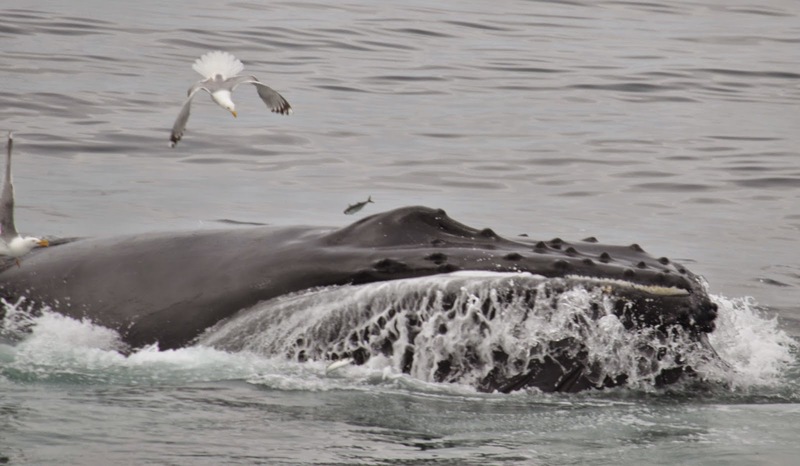 We first stopped on a pair of traveling/deep feeding humpbacks who turned out to be Doric and Flounder. This was my first time seeing Flounder this season so it was very exciting! We stayed on them for a while and then spotted two other humpbacks about 3 miles away and they were starting to kick feed. When we got there I was thrilled to find Rapier conducting some enthusiastic kick-feeding sequences and surging through the water’s surface open-mouth. 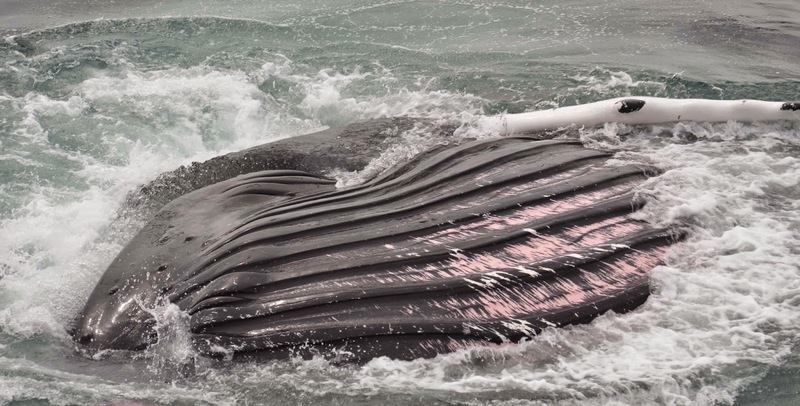 She even came belly-up sometimes or surged through sideways, giving us all a fantastic view of her expanding pleats. 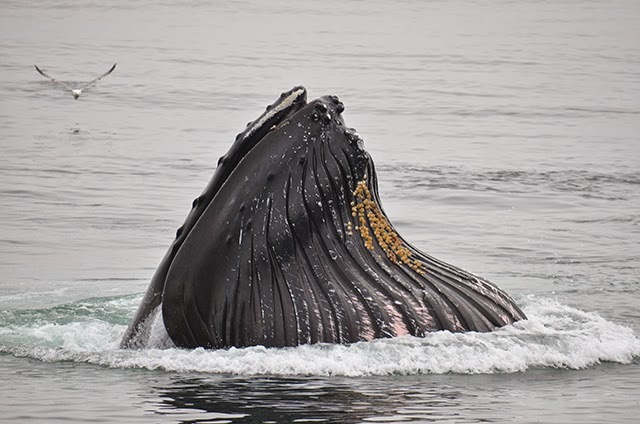 Humpbacks fall under the family named Rorquals, meaning red whales, and this is because of their expanding pleats underneath their jawline as they feed to hold all the water and fish in their mouths. The throat grooves in between the pleats have expanding blood vessels that will turn a dark pink and we were definitely able to see that well today. A side view of Rapier filtering—plus escaping fish and hungry gulls! Rapier started kick-feeding on both sides of our pulpits and could literally not get any closer to our boat! 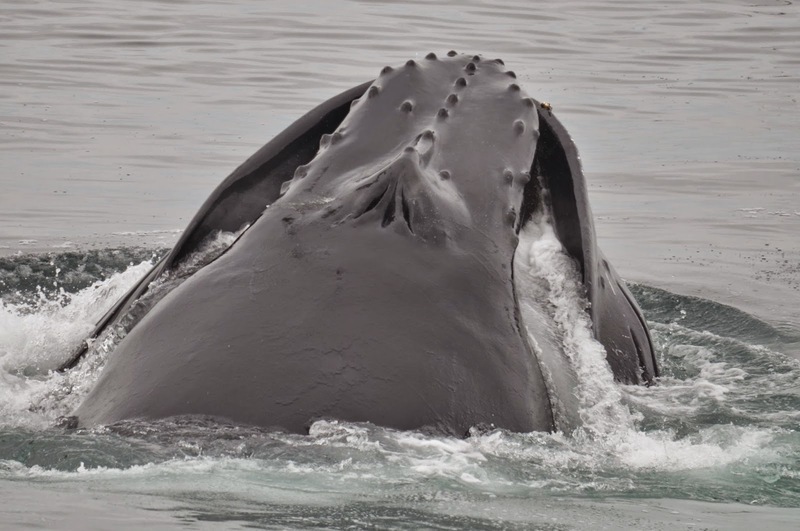 Passengers were amazed at her sheer size and were so excited to see her feeding so close to us! And with the water being so calm we could really appreciate her whole body length and I was able to see her head hanging towards the bottom of the bank as her tail was being held up in the air. 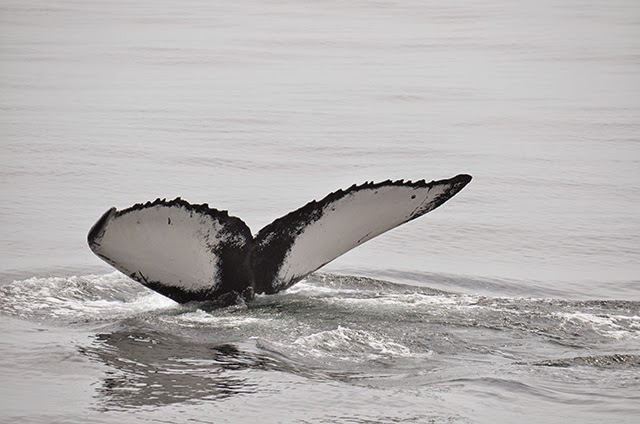 We had a phenomenal whale watch today, all in thanks to Rapier, Doric, and Flounder. On the 5:30 whale watch we had a difficult time locating humpbacks at first. There were an abundant number of minke whales seen around the southern portion of the bank, with a total of 7 recorded for the trip. We then saw Doric and Flounder taking 10 minute dives so we watched them for two surfacings and then made our way north. The passengers were very helpful in trying to spot for whales and called out anything they saw. It is always so nice when everyone is involved! After a while we found Daffodil taking about 7 minute dives and then Fulcrum was seen in the area. This was my first sighting of Fulcrum this season and it was very exciting seeing her coming up close to our boat. Hopefully she will be having another calf over the next few years. There was one humpback seen breaching a handful of times in the distance and other blows seen throughout the trip. And on our way off the back we stumbled upon two humbacks logging, or sleeping, and got a last look at some whales up close.